Internal door upgrade sytems can improve the fire resistance of your doors by 30-60 minutes. Each pack/kit can be used to increase the fire resistance of suitable wooden doors, whether they have flat panels, raised & fielded or are ledged & braced doors. 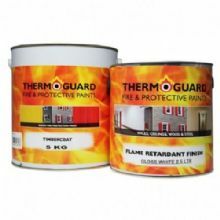 Available as a convenient pack containing the required basecoat and topcoat to protect 2 doors in a white or coloured eggshell or gloss finish. Fire Certificates for Authority approved projects are availble upon completion & proof of purchase.